Pirate Jam is first and foremost a Game Jam. A game jam is when developers get together to make games in a short amount of time, usually over the course of 1~3 days. Wikipedia has an excellent article on the topic. Check out other moving game jams like Train Jam and Splash Jam. How is Pirate Jam different? Day 1: Starts when everyone arrives at a pre-determined location for the kick-off meeting. Introductions are made, and basic setup tasks are handled. Developers are given a theme for the jam. Themes help to define what types of games are made. Teams are formed, boats are selected for teams, and an introduction to boat life and safety is given. Day 2: We head out into the great blue beyond. Our goal is to reach the first island destination and kick off 5 hours of development. During the sail we’ll cover additional safety and comfort training. Day 3 to 6: Will find us sailing between remote tropical islands, stopping each day for 5 hours of on-shore development. We’ll also find time for snorkeling, fishing, diving, and other pirate games. Day 6: We return to the marina and complete a final day of on-shore development. Day 7-8: Teams show off their finished game(s). Judges, both local and remote, score entries. Points earned from pirate games played during the adventure are combined with app scores to determine a winning team. Day 8 to 9: Everyone heads back home; now tan, salty, development pirates! Where does development take place? Along our sailing route there are dozens of beautiful tropical islands spotted with white sand beaches. We’ll stop at some of these, head to shore, and set up camp in various beach cafes and bars. A favorite stop is the Woodland Lodge on Ko Jum. 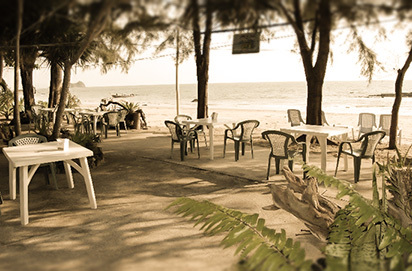 While you jam you can snack on delicious Thai food and enjoy cold drinks in a lush tropical setting. Bob Marley’s “We Be Jammin” will likely be playing in the background. What about Internet and power? Internet is available via 3G and 4G networks which cover all of the islands we’ll visit. Coverage also extends offshore to a great distance, so you can stay in touch with your land-based friends and families at all times. Most Pirate Jam vessels carry network sharing WiFi devices connected to the cell networks. Most of the cafes and bars we’ll visit have WiFi, but connections can be slow and intermittent. It’s best to prepare for development with limited Internet access in mind. Make sure you grab a Thai SIM card upon arrival in Thailand! Power is available aboard the boats from 12v cigarette lighter outlets and standard 5v USB outlets. 120v/220v outlets do exist on the boats, but are for emergency use only. Plan your charging hardware accordingly. 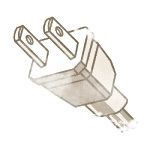 Pictured is the type of plug most commonly accepted in 220v Thai outlets. Lonely Planet has more on the subject of power and outlets in Thailand. Pirate Power Advice: Bring a 12v (car) charger and 120/220v (wall) charger for your laptop. Expect to charge your small devices (phones, tablets) with USB outlets on the boat (or from your laptop). You will need to bring your own laptop, development tools, and a waterproof shore bag (for taking your laptop to and from the boat). Why not jam on the boat? Staring at a computer screen while aboard a sailboat is a recipe for instant seasickness. Whole lotta nope! And now that we’re on the topic of the sailboats and seasickness, why not read the next section: Sailing!